Why are we here? Who are we meant to be? Is our life about being less or more than someone else? What does it mean to be a girl, a woman in this world? Do we have limits? Are we "as good as?" "Like the sun, I'm here to shine." Every single human being deserves to hear those words and to know they were written about her, him, them. Every single child should hear this book and know it has been written about them, him, her. This is a beautiful celebration of every single girl soul...and every soul. Turn each page and soak up the joy, the pride, the wonder that is you. Say it again, I Am Enough. Sing and soar and above all.... know you are here to "live a life of love, not fear." We all matter. We are all made of the right stuff..the stuff of stars. This is an ode to inclusivity, to the power of being a female and to the amazing gift we all have of being empowered to make a difference in our world. This book belongs in every home, in every library, in every school, in every hospital, in every juvenile delinquent facility, in every prison, in every church, in every temple, in every mosque.... in the hands and hearts of every single girl...and the boys need to hear it too. Every girl can read along with these powerful affirmations and take them in for her own sense of self. Beautiful, heartfelt, this is the one. 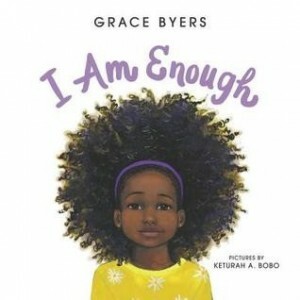 I Am Enough is the picture book everyone needs.